Congratulations on your new purchase! You are just steps away from creating a beautifully patterned lawn using your new CheckMate™ lawn striping roller. 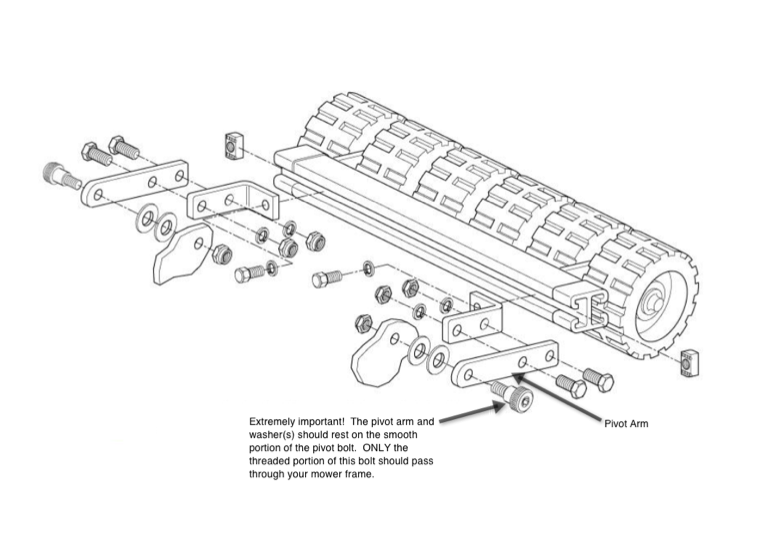 To ensure a long life of both your mower and roller, please be sure to follow the mounting recommendations below. Step 1: Photo 1 depicts the mounting location of the CheckMate™ striping roller. Note that the existing hole in the solid black framing material must be opened to exactly 3/8” of an inch to accommodate the CheckMate™ pivot bolt. This can be done quickly and easily using a standard 3/8” drill bit. Step 2: Using the schematic drawing in Photo 2, use the supplied nuts, bolts and lock washers to firmly attach the CheckMate™ pivot arms to the corresponding L brackets. 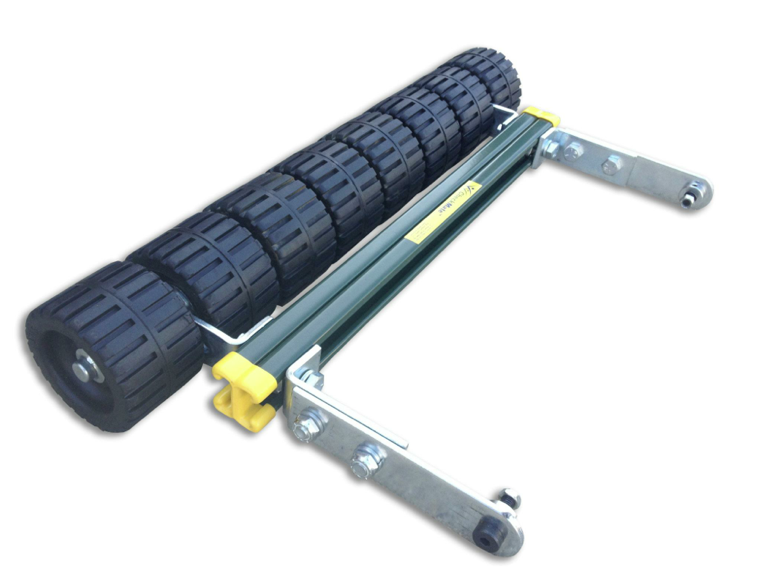 Using the specially designed ‘channel nuts’, loosely attach each of your mounting arms to the green channel that parallels the roller. Please make sure that the ‘teeth’ of each of these channel nuts are facing ‘up’ when placed inside the green channel. Finger tighten each of the mounting arms into place so that they are aligned towards the outer yellow protective end caps. Hint… you may place the rectangular channel nuts inside the green channel and then turn them 90 degrees to position them into place. Step 3: You are now ready to mount the roller to your mower [Photo 3]. Temporarily remove your bagger from the mower. 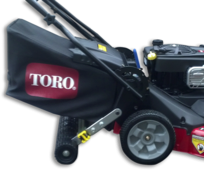 Slide the roller into place behind the Toro® TimeMaster®. Beginning with one side, insert the hex head pivot bolt through the pivot arm. Install 1 washer on the ½” smooth portion of the pivot bolt and allow only the 3/8” threaded portion of this pivot bolt to pass through the 3/8” hole in the mower framing material. Lock the pivot bolt into place using the supplied 3/8” nylon lock nut. Repeat this process for the opposite side. Each of the two pivot arms should now be able to freely pivot up and down on their pivot bolt. 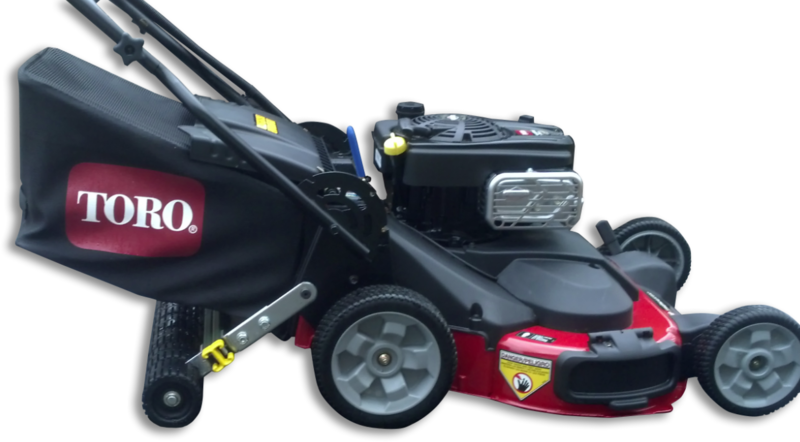 Your last step is to center the roller behind the mower and to firmly tighten each of the two mounting arms to the green channel. 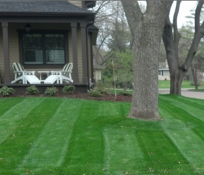 Step 4: Reinstall your mower bagger and enjoy creating beautiful patterns with your newly purchased CheckMate™ lawn striping system [Photo 4].